If your jeans gap slightly or are a little too big at the waist, you may be able to fix the issue by taking in the waist yourself. If you are an experienced seamstress, take in the waistband in the back for a professional look. For an easier sewing project, try taking in the waist on the sides instead. Even if you don’t have the skills or patience to sew your jeans, you can still tighten the waistband without sewing by using an elastic band. Pull the waistband snug from the back and pin it in place. Put your jeans on and pull the back of the waistband with one hand to adjust it to the right size. Pinch the extra fabric of the waistband with your free hand and secure it with a large safety pin. Pinch just below the safety pin to pull out the excess fabric and secure it with a straight pin. Continue pinching and pinning down the back seam until there is no more excess to pin and your jeans fit well in the waist and hips. Be careful not to catch your underwear (or your skin!) when you are placing the pins. Try to pin as far down as you can along the seat of the jeans. The further you go down, the less noticeable the transition from the original thread and your new thread will be. Mark the inside of the jeans along the pinned seam and take out the pins. Take the jeans off carefully. Place them face up on a flat surface and pull the front waistband down so you can see the inside of the back waistband where you’ve placed the pins. Mark along the center of the pinned seam with fabric chalk, making sure that it leaves a line on both sides of the seam. Then, take out the pins. If you don’t have fabric chalk handy, you can also use a highlighter. Cut out the waistline stitching between your markings, plus on each side. Use a seam ripper to take out the top and bottom row of stitches along the waistband. Remove all the stitching of the two rows on the waistband between the chalk marks, plus on each side. Leave the stitching along the top edge of waistband and the seat of the jeans for now. To make sure you don’t rip out too many stitches, try cutting the first and last stitch you would like to take out. Then, pull at the loose threads to take out all the stitching in between. Remove the belt loop(s). Take off any belt loops between your two chalk lines. To do this, carefully clip away the thread attaching the belt loop(s) to the waistband. If there are any leftover threads from the belt loop after you remove it, leave them in place. Sewing over these when you reattach it later will help disguise the alteration. Take out the stitching from the top edge of the waistband and from the center of the seat. Carefully cut the stitching on the top edge of the waistband along the same length where you removed the two rows of waistband stitching. Separate the two layers of the waistband. 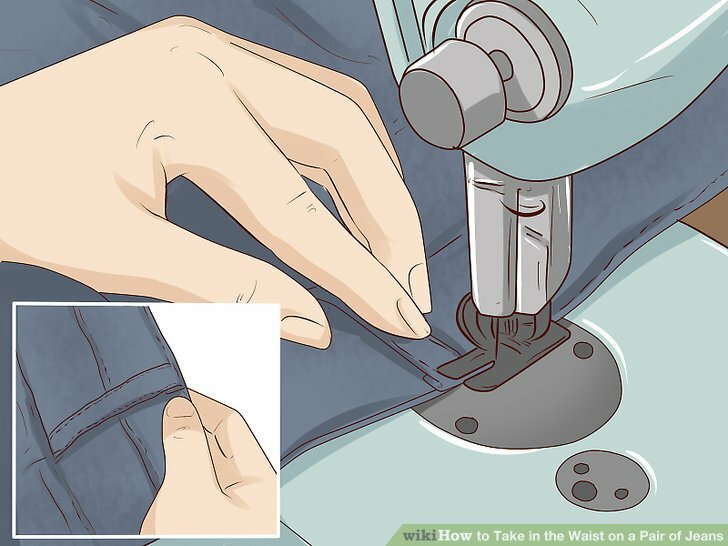 Use a seam ripper to take out the row of stitching on the inside of the jeans from the waistband down to about below your chalk lines. Remove the corresponding stitching on the outside of the jeans as well to fully separate the seat of the jeans. It may make it easier and more precise to cut the first and last stitch you would like to take out, and then pull at the loose threads to remove all the stitching in between. Fold the inner layer of the waistband and sew across it with a straight stitch. Fold the waistband across the center back line of the jeans, the midpoint between the two chalk lines. Fold with the right sides (the sides facing towards the outside of the jeans) facing each other, so the folded edge is facing you. Sew where the new altered waistband meets from the top to the bottom of the waistband with a single straight stitch. To reduce the bulkiness of the new waistband, you can cut off the extra fabric outside of your stitches. Leave about of fabric outside the stitches. Press the cut ends of the fabric with an iron so they open up on each side of the seam. You may find it easier to pin where you would like to sew and draw a chalk line as well to help keep you on track. Repeat the alteration with the outer waistband. Take in the outer waistband, using the inner waistband as a guide. Fold it in the middle, sew it, then trim and press the edges. 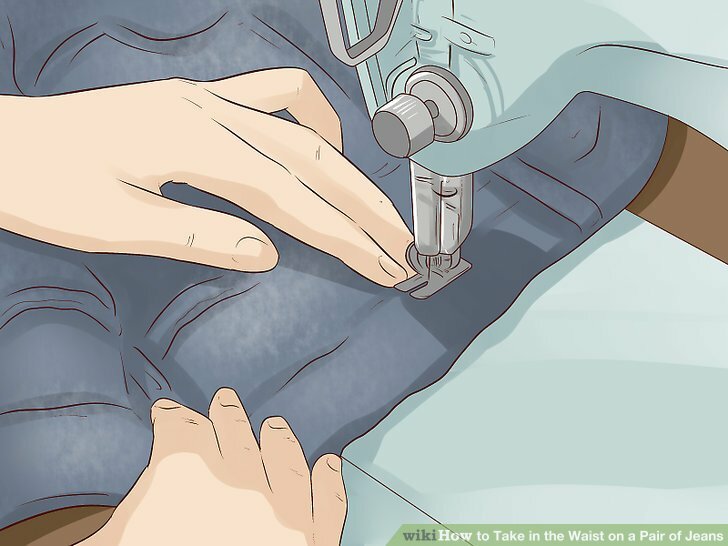 Sew the seat of the jeans back together with a single straight stitch. 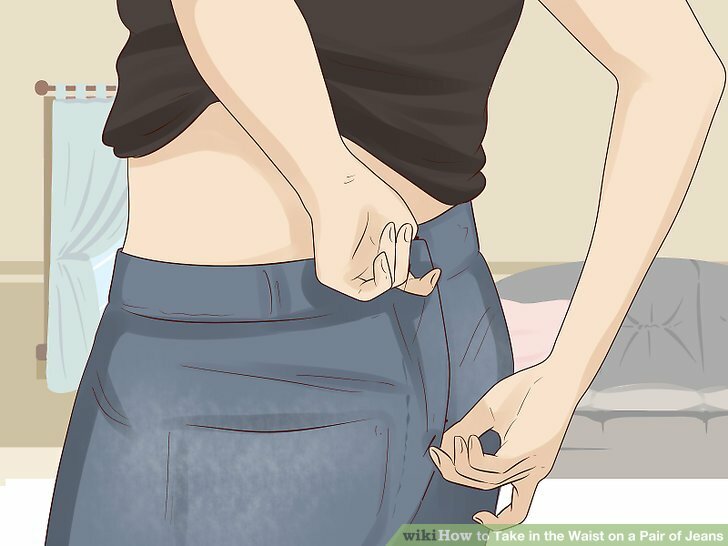 Pin the seat together by turning the right sides (the outside of the jeans) to face each other. Pin along the chalk lines you made earlier. Sew the seat together with a single straight stitch next to the pins. It may help to take a hammer and pound the original jean seam you are sewing across in this step. This will flatten out the layers of fabric there and make it easier to sew across. Try on your jeans after you sew the seat to make sure the seams look straight and properly positioned. If anything looks funny, use your seam ripper to take out the seams and resew that section. 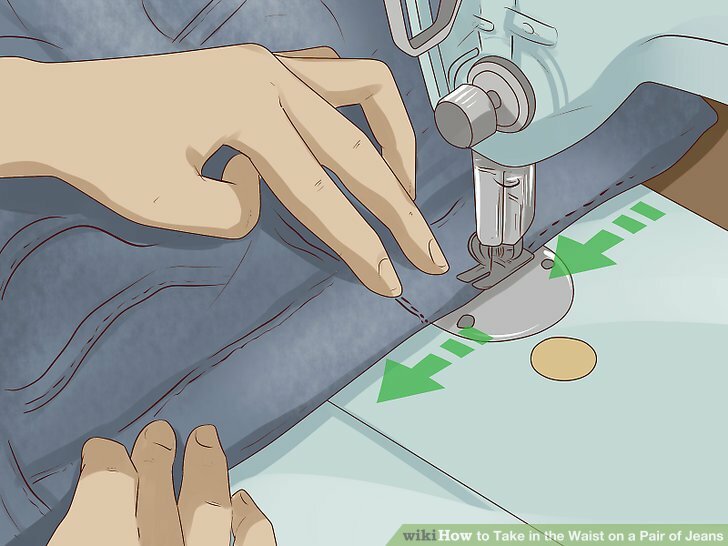 Sew topstitching with a single straight stitch on the outside of your jeans. To give your altered jeans the same outward appearance again, use topstitching thread to sew from the existing stitching lines up to the waistband in two rows, matching the stitching on the rest of the jeans. Overlap a few stitches with the old stitch line to make it blend together better. Using a longer stitch length setting on your sewing machine can make the topstitching look more professional. Try stitch length. 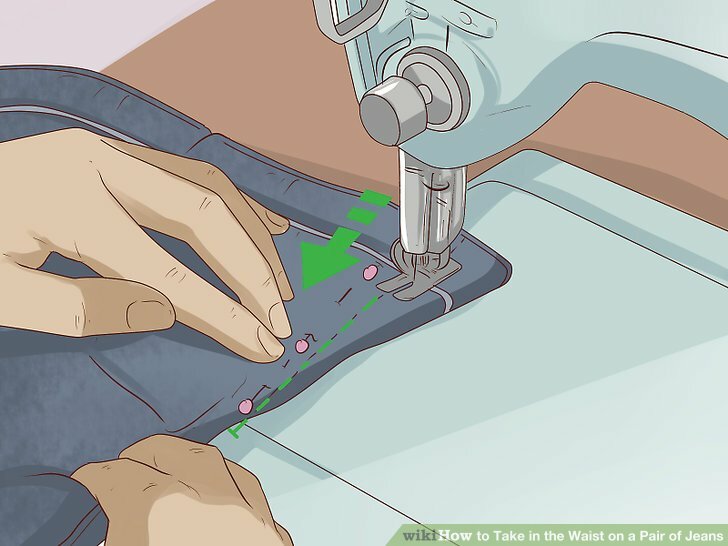 If you have a double needle for your sewing machine, you can also use that to sew both lines of topstitching at once, instead of doing the two lines separately. If you can’t find topstitching thread, you can also try to use two strands of all-purpose thread at the same time to get a chunkier look that will better match the original topstitching. 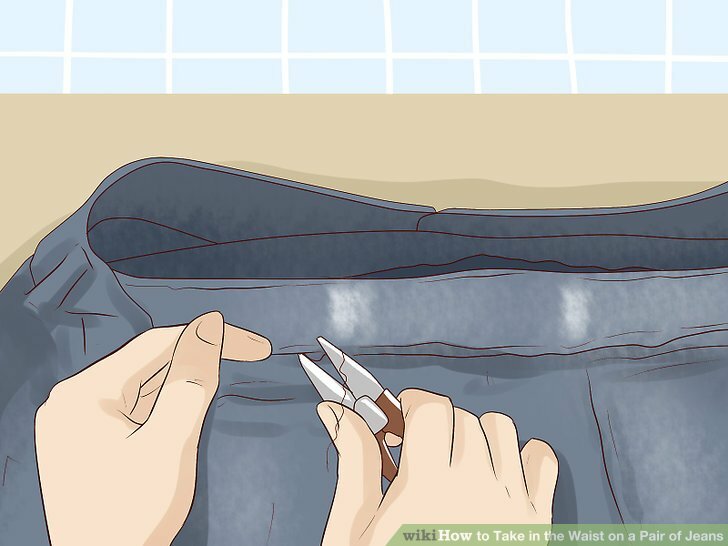 If your jeans are very worn along the seat area and the topstitching you put in looks too new and out of place, try roughening it up a bit with a nail file. Sew the belt loop back on with single straight stitch. Sew the top and bottom of the belt loop back onto the waistband in the center. Be sure to match the thread color of the other belt loops. It may help to hammer where you will sew first, since you will be sewing through many layers of denim. 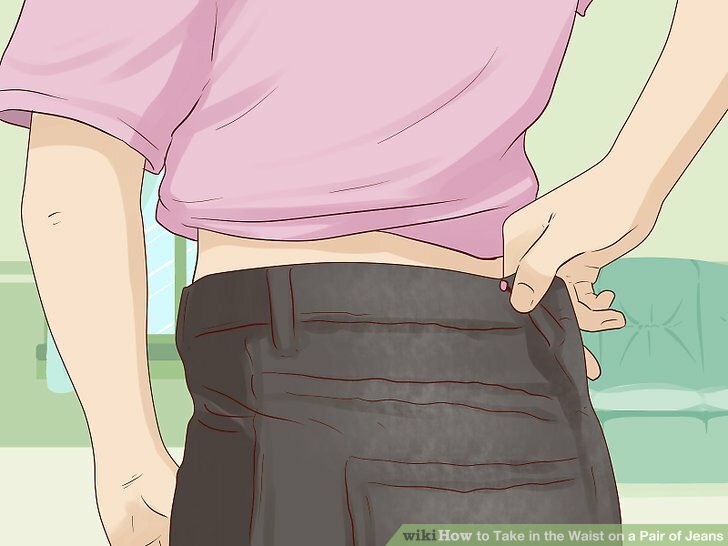 Put your jeans on inside out and pinch the waist at the sides until it fits. Turn your jeans inside out and put them on. Pinch the waistband on each side until you get the right fit in the waist. 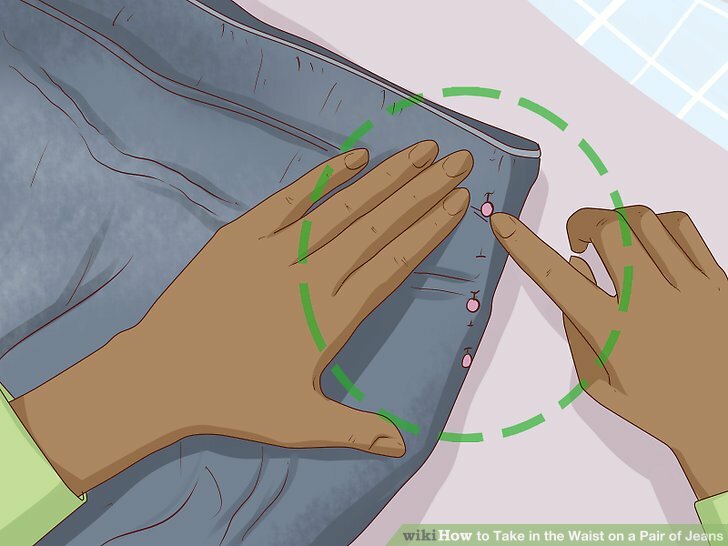 Try to pinch an equal amount on both sides so that your jeans will sit evenly after the alteration. You can secure the pinched fabric with a large safety pin to help you as you proceed to the next step. Secure the excess fabric on both sides with straight pins. Carefully put the pins in the waistband on each side where you have pinched the fabric, as close to your waist as possible to keep the jeans snug. Be careful not to pin your finger. Keeping pinning down the sides of the jeans where you can pinch out loose fabric. Pin as far down as you would like, depending on how you would like the jeans to fit. You can pinch and pin just along the waist, down to the mid-thigh, or even all the way down to your knee if you want a extra skinny fit. Sew next to your pins with a single straight stitch. Carefully take your jeans off. 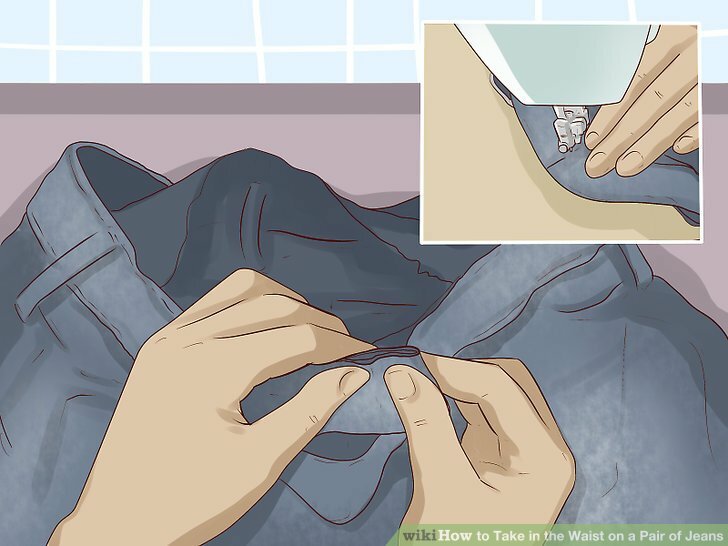 Sew each side of the jeans along the pinned line. Use a sturdy denim needle, a longer stitch length than normal, and higher tension. Go over the stitches again with a backstitch (reversing back over your stitches) at the beginning and end to secure the stitching in place. Try a stitch length of 2 and a thread tension of 4 to start. If that doesn’t work, you can easily take out the stitching with a seam ripper and try again with different settings. Don’t be afraid to experiment until you are happy with how your seam looks. Turn your jeans right side out and try them on. Try your jeans on again and check the fit. You can always take your stitching out and try again if there is something off. If you are happy with the fit, but feel like excess fabric inside the jeans is too bulky, you can cut it out. Leave about a border outside the stitching to prevent the fabric from unravelling. Otherwise, you can leave the fabric in. You can also fold the excess fabric to one side and sew the end down so it lies flat inside when you wear them. Pinch the extra fabric at the center back of the waistband. Put your jeans on. 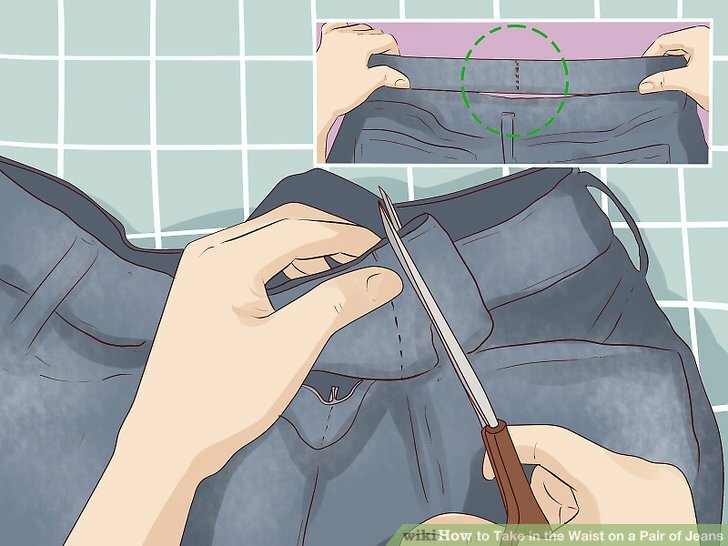 Pinch the excess fabric in the back of the waistband so that the jeans fit snugly. Ironing the waistband before putting your jeans on can help make your measurements and fit more accurate. Mark each side of the pinched fabric on the inside of the jeans. Keep the fabric pinched. 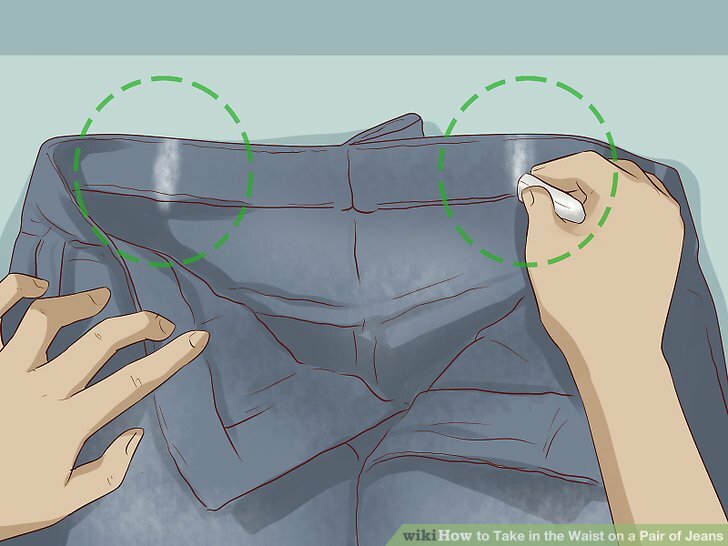 Use fabric chalk or a highlighter to make a small line inside the jeans on each side of the pinched fabric where you will want your new, smaller waistband to touch. Cut two slits in the inner waistband to allow the elastic through. Remove the jeans and lay them with the front side facing up. Pull the front of the jeans down to reveal the back of the waistband. Cut out a few stitches from the bottom of the waistband below each of your two highlighter marks. Use scissors to cut a slit from one of the broken seams to just before the top of the waistband. Only cut through the inner layer of the waistband. Cut another slit on the other side. The slit should be at least long to accommodate the elastic. Prepare a elastic band. Measure the elastic band and cut it so it is slightly smaller than the distance between the two slits on the waistband. Attach a safety pin to each end of the band. The shorter your elastic band, the tighter it will pull the waistband. Slip the elastic band through the slits and attach it to the jeans. To do this, attach one end of the elastic band with a safety pin to the waistband outside one of the cuts. Thread the other end of the elastic through to the other slit in the waistband. Attach it to the outside of the slit with another safety pin. You may need to cut out the tag from the jeans if you cannot push the safety pin through. Only stick the safety pins through the inner layer of the waistband so won’t show from the outside. If you want to alter the waistband again later, you can always use a looser or tighter elastic band. You can also sew the elastic in place with a single straight stitch instead of using safety pins if you want a more permanent solution. Topstitching thread, in a color that matches the stitching on the waistband. It’s best to alter a pair of jeans when it is freshly washed or dried. A pair you’ve been wearing all day will be little stretched out and that can throw off your alteration. It’s not a good idea to take in the waist more than because it can change the pocket positioning and affect how the jeans fit in the hips. Don’t try to alter your favorite pair of jeans until you have practiced a bit with other pairs first.